MINNEAPOLIS (AP) — Minnesota Wild forward J.T. Brown was arrested on suspicion of public intoxication in Dallas hours before the Wild’s season finale. Police reports indicate the incident happened at British Beverage Company early Saturday. Brown did not play in the Wild’s final game that night against the Dallas Stars, who beat the Wild 3-0 to take the Western Conference’s top wild-card spot. The Wild announced he was out because of illness. Brown apologized to the Wild, his teammates, family and fans for making a “poor decision.” He said in a statement to the Minneapolis Star Tribune he put himself in “a bad situation” and takes full responsibility. The Wild said the team is aware of the report and has no comment. Dallas police say an off-duty police officer was advised by employees of a nearby business that Brown was causing a disturbance with other patrons and employees inside the business. Brown was asked to leave and escorted off the premises. Police say Brown later returned and caused a verbal altercation with the staff. He was taken into custody by officers and processed for public intoxication, a misdemeanor. Police say it was later discovered that Brown was a member of the Wild. The 28-year-old Brown was in his first season with the Wild after signing a two-year, $1.375 million contract last July as a free agent. 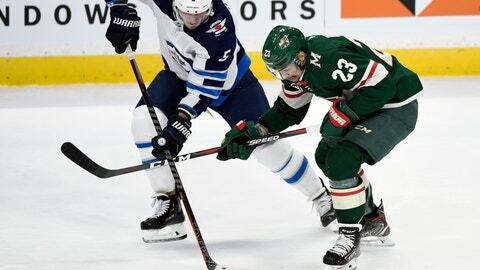 The Burnsville, Minnesota, native and former Minnesota Duluth standout appeared in 56 games, recording three goals and eight points as the Wild’s fourth-line right-winger. He previously played for the Tampa Bay Lightning and Anaheim Ducks.